Grimaldi Lines 2019 – 30% Combination Discount Travel from Brindisi to Greece and return to the port of Ancona or Venice and save money. 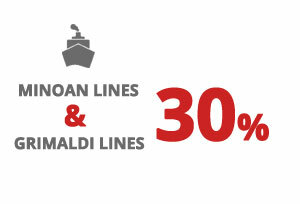 By booking your first ticket with Grimaldi Lines and the second one with Minoan Lines, you are entitled to a 30% discount. Grimaldi Lines – 20% Return Discount Greece Take advantage of the return trip discount offered by Grimaldi Lines. 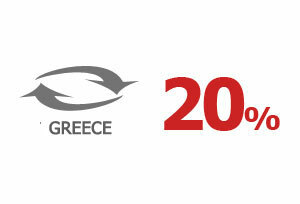 Book your return ticket to / from Greece at the same time and take advantage of the unique offer of 20 %. Grimaldi Lines – 50% Children Discount Do you wish to travel with your children? Grimaldi Lines has a great offer for you. 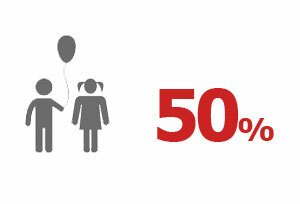 Children from 2 up to 12 years old are entitled to a 50% discount and they travel for FREE if they are up to 2 years old! Book your tickets now! 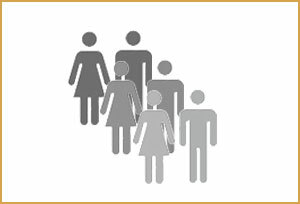 Grimaldi Lines – Group Offers Are you traveling with a group of 16 or 160 passengers and worry about the high costs? No more! Grimaldi Lines offers great group prices.